We recently attended the 52nd Human Response to Vibration Conference & Workshop at Cranfield University where Svantek Poland’s Marketing Manager, Jacek Kuczynski, gave a presentation on ‘The impact of contact force on the accuracy of hand-arm vibration measurement’. Below is an abstract from a paper produced by Jacek and Piotr Kowalski Ph.D (Eng) from the Central Institute for Labour Protection in Warsaw which details a recent study into the use of hand-arm vibration adapters and the accuracy of hand-arm vibration measurements, in function of the contact force. The Institute performed 240 measurements where the impact of coupling force on vibration magnitudes was assessed using Svantek’s SV106 human vibration meters and SV105AF hand-arm adapters. The two Svantek SV106 human vibration level meters meet ISO 8041:2005 requirements, and are designed to perform measurements in accordance with ISO 5349-1 and ISO 5349-2 standards, with special SV105AF hand-arm adapters mounted on handles of vibration exciters. Measurement of hand-arm vibration with the use of a hand mounted sensor ensures the most representative measurements, taken at the point of contact of hand with a vibrating tool. When measuring vibration on a hand, simultaneous measurement of contact force verifies whether the force magnitude is sufficiently rigid. The contact force also provides information on operator’s work schedule and may help to instruct users if they are using excessive or too little force when working with hand-held tools. Additionally, by knowing both the coupling force value and the vibration acceleration, it is possible to calculate actual vibration energy dose that has been transferred to a hand. The results proved that measurements taken with hand-arm adaptors provide correct vibration results regardless of contact force changes and type of vibration signal. The study has also indicated that it is necessary to define a minimum force threshold in order to mitigate the uncertainty related to the contact between hand and a vibrating tool. The study proved that the effect of changes of the force thresholds applied by the operator are irrelevant to the measured vibration acceleration values. This assumption is valid for the forces above threshold of 20 N, below which it is necessary to ensure the correct coupling between hand-arm adaptor and vibrating surface. Together with the force level drop below 20 N, the uncertainty related to the coupling increases rapidly. However it is necessary to note that in practise, for tools generating high vibration amplitudes, the threshold of 20 N may not guarantee the perfect coupling, therefore higher threshold levels should be established. At the time the ISO 5349 standard was introduced it was practically impossible to perform force measurements together with tri-axial vibration measurements due to limitations in hardware. At the moment very small force transducers can be fitted right next to the MEMS-technology-based vibration accelerometer in a form of hand-arm adaptor as specified by ISO 5349-2 and ISO 10819 standards. In comparison to the technique of mounting sensor on a tool, the use of contact force allows defining the actual vibration exposure, whereas mounting on a tool bears the uncertainty of including into tests the periods when there was no contact with the operator’s hand. 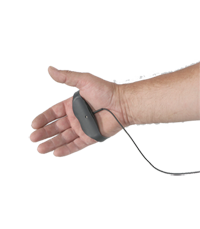 As it has been proven, the use of hand-arm adaptors provides the same accuracy of vibration amplitudes as in case of standard piezoelectric vibration sensors mounted on a tool, but additionally offers the advantage of the best possible location of the measurement point – exactly at the point of transmission of the vibration signal to the hand of an operator and provides information on the actual exposure to the vibration.